Every now and then I break out of my kitchen and work part-time for a luxury French retailer favored by everyone from Princess Grace to Beyonce. It’s a nice change of pace for me, and I feel very fortunate to work with beautiful people and beautiful products. How fun to shed my yoga pants and Ugg slippers for something slightly more sophisticated! But for as much as I enjoy working, I’m always amazed at how hard it is — even the teensy weensy amount of time I work — and I give working moms all the credit in the world. Wait, you want me to work all day AND still feed you AND still do your laundry AND still drive you places? What? Seriously, I don’t know how you people do it, but hats off to you. Working, even just a little bit, inspires one to seek out recipes that lend well to quick preparation. Sure, you can always order pizza, but making your own pizza gives you good mom points for preparing real food. With a little forethought, Jim Lahey’s no knead pizza dough recipe is a pretty easy alternative to takeout. Just like his world renown no knead bread recipe, this pizza dough lets time do all the hard work for you. In other words, next time you are wondering, “What should I make for dinner tomorrow night?” get out your flour, active dry yeast, salt and water, and start thinking about homemade pizza. Flour a work surface and scrape out the dough. Divide it into 4 equal parts and shape them. For each portion, start with the right side of the dough and pull it toward the center, then do the same with the left, then the top, then the bottom. (The order doesn’t actually matter; what you want is four folds.) Shape each portion into a round and turn seam side down. Mold the dough into a neat circular mound. The mounds should not be sticky; if they are, dust with more flour. Put the pizza stone on a rack in a gas oven about 8 inches from the broiler. Preheat the oven on bake at 500 degrees for 30 minutes. Shaping the disk (Method 1): Take one ball of dough and generously flour it, your hands, and the work surface. Gently press down and stretch the ball of dough out to 10-12 inches. Don’t worry if it’s not round. Don’t handle it more than necessary; you want some of the gas bubbles to remain in the dough. It should look slightly blistered. Flour the peel (or an unrimmed baking sheet) and lay the disk onto the center. It is now ready to be topped. Switch the oven to broil for 10 minutes. With the dough on the peel, spoon the tomato sauce over the surface and spread it evenly, leaving about an inch of the rim untouched. 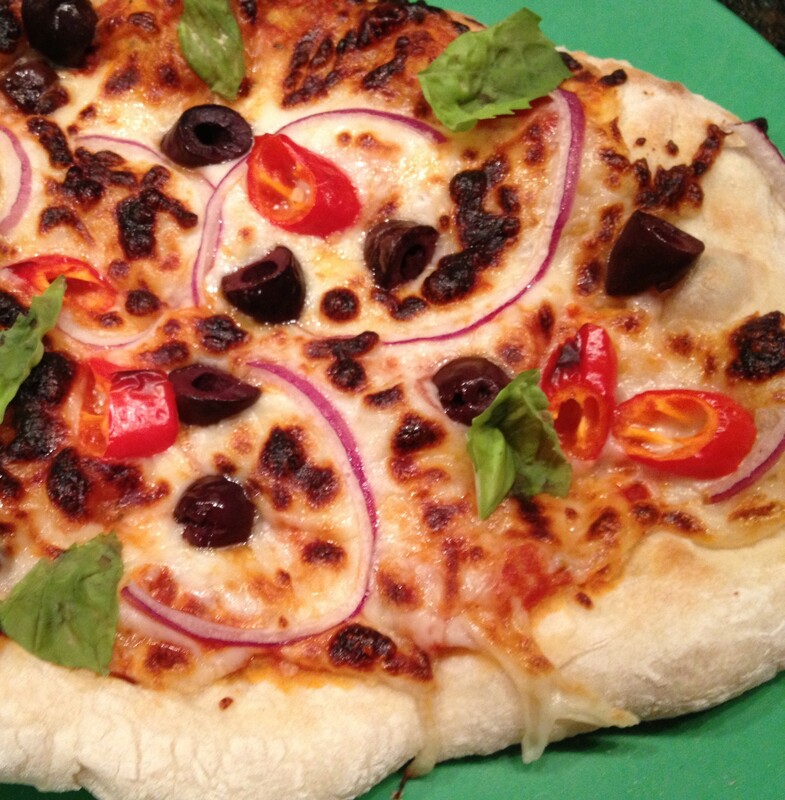 This entry was posted in Main Dish and tagged homemade pizza, no knead pizza dough by Mom Mom's Apron. Bookmark the permalink. Bookmarking it and can’t wait to try it. Bread has always scared me. I’m not really sure why – yeast is pretty frightening. Thanks for the recipe! Hi! I can’t wait for you to try it. Actually, I would suggest starting with the recipe linked in the post for NYT no knead bread. I swear, you will impress everyone and feel like a pro! My dh, Jay, has mastered the Bob’s Red Mill Gluten Free Pizza crust and we are all quite pleased with the Friday night Gluten free pizzas we come up with. Your crust looked really good! And being a new back to work mom…I totally agree with your comments. I don’t know how but we are managing to survive this big transition. You are doing great, Claire! This recipe produces the best pizza crust I’ve ever made, and I’ve made a bunch, with several recipes. My old recipe was pretty good, but this one is great! I like a thicker crust, more like those in Naples and Sorrento, so I would split the dough into only two portions, and spread it out to 12 or 13 inches, with a moderately thick edge (pretty much like in your picture). With the thicker crust, I baked it a little longer, turning the broiler off when I put the pizza on the (very hot) pizza stone, then baking it around 450F until it looked done, about 8 to 10 minutes. The only real problem with this is the long wait for the slow rise to complete– you’ve got to start the day before– but I believe that is essential for the good flavor of this crust. Alas, I can no longer make this, as I just got put on a gluten free diet. But I’m looking for something that approximates it. Thanks for your input! I’m glad you liked the recipe so much. Sorry to hear you’re going gluten free, although it seems to produce amazing results for people. Eventually I hope to try and post a recipe for cauliflower crust pizza, so stay tuned!